The following is an excerpt from Elder Nelson’s autobiography. He relates an experience where he saw President Harold B. Lee following his passing. I learned about his (President Harold B. Lee) passing while I was home playing games with the children, still full of the festive spirit remaining from Christmas the day before. The announcement came on the television that President Harold B. Lee had suddenly become stricken and had died at the LDS Hospital. Shocked and struck with grief, I had an overpowering urge to leave home and go at once to the LDS Hospital. As I rushed there to the side of President Kimball, I quietly mourned for the loss of this giant in the kingdom, my beloved and esteemed friend, President Harold B. Lee. Since the passing of President Lee, I have had two very special dreams involving him. The first was in April of 1975. The substance of that message is too sacred to mention here, but it was a very reassuring and humbling experience. The second occurred on September 16, 1978. In the dream were two vivid messages: first, that if President Lee had gone on living, a very severe affliction would have developed in his body which, if allowed to progress, would have given him great pain, suffering, and incapacity. The medical details of this were dreadful and distressing. He said his sudden death in December 1973 was brought about as an act of love and mercy, for the Lord wished to spare him and the Church the misery that otherwise would have ensued. His second message was that the revelations received and the actions subsequently taken by President Kimball were the very same as would have been received and performed by President Lee had he remained as the prophet. President Lee exclaimed that the Lord gives His will to His living prophet regardless of who he prophet is at the time, for the Lord indeed is directing His Church. These two dreams were just as real as anything can be, and I cherish the privilege of these relationships with President Lee, extending as they do beyond this mortal sphere. 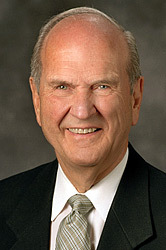 Russell M. Nelson, From Heart to Heart: An Autobiography, Quality Press, 1979, p. 159-160. This entry was posted in Death, Evidences, Friends, Happiness, Miracles, Prophets, Receiving Revelation, Spirit World, Stories from Church History and tagged death, dreams, prophets, Receiving Revelation, revelation, The Spirit World, visions. Bookmark the permalink.